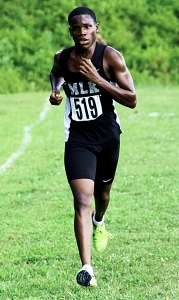 Senior Demetrius Carson won his second consecutive meet in DeKalb County competition to lead the Martin Luther King Jr. Lions to their second consecutive team win in Tuesday’s first DCSD varsity race at Arabia Mountain. Carson clocked a time of 22:04.60 to finish almost eight second ahead of Stephenson senior Donald Griffin (22:12.30) who had led at the halfway point of the race. The Lions finished with 18 points to Cedar Grove’s 66 with five runners in the Top 10 to finish. King took the third through fifth spots as junior Zai Anderson Brown (22:41.9), senior James Adeferakan (23:08.20) and junior Jamari Hopkins (23:12.40) rounded out the Top 5 runners. Second place Cedar Grove was paced by Francisco Barberena (23:45.50) in sixth and Terrence Lewin (23:45.70) in seventh. Lithonia junior Zephaniah Corker (24:02.60) was eighth followed by King junior Phillip Ellison Jr. (24:18.80) and Arabia Mountain senior Elijah Bibbs (24:43.30) to complete the Top 10. 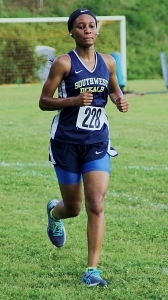 The girls’ opening race of the day did not have any team scores, but Southwest DeKalb senior Lanee Edwards crossed the finish line first in 26:06.20. The second varsity race at Arabia Mountain ended in a sweep of the boys’ and girls’ meet by Druid Hills. Druid Hills had eight of the first 10 boys’ to cross the finish line to outrun Tucker 19-61 for the win. The Red Devils were led by three seniors in Carter Rathur (19:51.40), Siddhartha Narker (20:10.10) and Ian Shunk (20:12.00). Tucker senior Ian Nuhfer (20:25.90) and freshman Abedelemeji Kerebo (21:33.20) finished fourth and fifth, respectively. The next five Red Devils in order of finish were Junior Ted Shephard (21:34.50), sophomore Harrison Baer (21:40.60), sophomore Cori Stockard (22:10.70), junior Krubel Shimendi (22:22.90) and junior Justin Franklin (22:40.60). In the girls’ race, Druid Hills reeled off the first nine places of the race in outdoing Tucker 15-50 in the win. Junior Genevieve Ferrara (24:39.00) came in as the leader on the girls’ side ahead of teammate senior Abby Thompson (25:09.20). The Top 5 included in order Druid Hills’ sophomore Reese Rathur (25:41.90), junior Asena Anderson (26:05.40) and junior Lucy Grady (26:55.20). Check out the Druid Hills Middle School course next Tuesday, September 4 as it will play host to a pair of boys’ and girls’ varsity races and a junior varsity boys’ and girls’ race beginning at 5:15 pm.